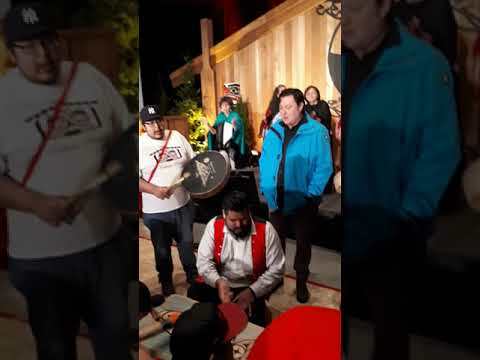 Beachkeeper, dedicated son, loving uncle and traditional language teacher were some of the roles Larry Paul was remembered for gracefully filling when over 100 Nuu-chah-nulth-aht converged on Wednesday in Port Alberni to honor his memory. Kiiciny`ahs (Paul) passed on Sunday, April 1 at the age of 84, leaving a legacy that many hope will be retained by future generations. Born in Port Alberni on May 22, 1933, Paul spent most of his life in the ancestral home of Hesquiaht Harbour, with some time in Victoria and in recent years residing in Hot Springs Cove. He was known for his dedication to his mother, Alice Paul, who he frequently transported. “He was like a full-time chauffeur to her,” recalled niece Angela Galligos at the memorial gathering. As a fluent speaker in his Hesquiaht dialect of Nuu-chah-nulth, Paul made the Hesquiaht Dictionary in an effort to preserve the language of his ancestors. During the gathering Hesquiaht Chief Councillor Richard Lucas spoke of Paul’s role in passing the traditional language down to Hesquiaht’s younger generations. Paul held the title of Hesquiaht’s traditional beachkeeper. This role welcomes visitors to the hahoulthee, carrying a historical duty of tying up the canoes – as well as granting permission for the canoes to be released when the visitors depart. The title is now to be transferred over to Paul nephew, Wayne Galligos. The need to carry on traditions was stressed by many who stood up to speak at the gathering, including Connie Charleson.